With so many businesses operating online, standing out from the crowd is essential. Content marketing is a great way to help you attract your audience’s attention. 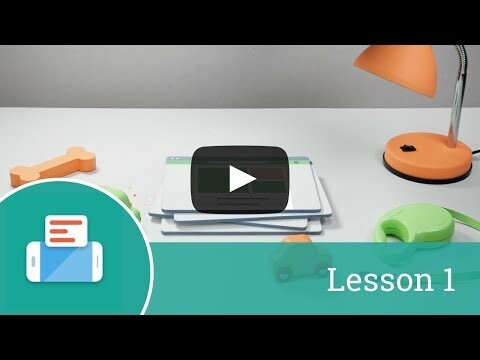 In this lesson, we’ll look at why content marketing is important, and how you can use it to engage with your audience. We’ll also introduce some best practices to help you create your own content marketing campaigns. Content marketing is based on the creation and sharing of online material, like videos, blogs, and social media posts. It’s designed to generate interest in a company’s products or services by capturing people’s attention. It can also help to increase sales by directing traffic to your website, boost awareness of your brand and build trust and recognition amongst your audience. Let’s journey back to the days before the web, when TV, print and radio dominated. Two-way interaction wasn’t possible between brands and customers and audiences received advertising messages whether they wanted them or not. These days, people can pick and choose when they engage, and content marketing allows businesses to connect with their audiences like never before. Imagine you run a dog walking business, and want to use content marketing to increase awareness of the company and drive more traffic to your website. To achieve this, you could publish engaging content about dogs on your website’s blog, and promote it across the company’s social media platforms to increase readership. Great content campaigns are based on understanding who you’re writing for. The more you know about your audience and share their passions, as well as their pains, the easier it will be to engage them on a personal level. Try considering the challenges or pain points your customers face, and then tailor your content to these insights. For the dog walking business, for example, pain points for customers could include a lack of time, bad weather, or simply wanting to keep their pet happy. Next, let’s cover some effective content marketing practices. The key to success is creating a content marketing campaign that accomplishes three things: (1) answering your audience’s questions, (2) providing something of value and (3) keeping them wanting more. - make your content unique, interesting and exciting. Use engaging headlines, eye-catching pictures and informative language to capture your audience's attention. By keeping these pointers in mind when creating a content marketing strategy, you can boost your potential reach and strengthen your presence online. - keep them engaged so that they’ll visit you in the future for more content. Now, try brainstorming how content marketing can be used to engage your audience online, and consider what goals it could help you achieve. best practices for creating your own content marketing strategy.